"All the women of the Bible" offers a rich biographical perspective on evey female figure in scripture -- including the famous, the little-known, and even the unnamed. In more that 300 engaging and insightful portraits, Edith Deen brings alive the saints and sorceresses, queens and servants, mothers and daughters, wives and widows whose profound influence is felt through-out the Bible. "You can almost trace light and darkness in the Bible by the women themselves,"she writes. "Hannah, praying mother of Samuel, gave birth to a son who became the first great Hebrew prophet. And, of course, there was the mother of Jesus. On the other hand, Jezebel and Herodias were vile influences, the first tearing apart the northern kingdom of Israel, the second causing John the Baptist to be beheaded. "Combining thorough detail with a lively and dramatic narrative, All of the Women of the Bible portrays the real women behind the Biblical stories and shows how, in their human struggles and triumphs, they are very much like the women of today. With each major biography identified by Bible chapter and verse and prefaced by a key passage of scripture, this is an ideal resources for teachers, Bible students, preachers, and writers, as well as anyone who wants to learn what it was really like to be a woman in Biblical times. All of the Women of the Bible: 316 Concise Biographies by Edith Deen was published by Zondervan in August 1988 and is our 22269th best seller. The ISBN for All of the Women of the Bible: 316 Concise Biographies is 9780060618520. 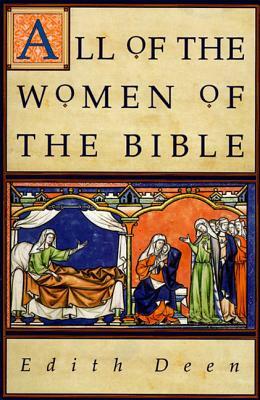 Be the first to review All of the Women of the Bible: 316 Concise Biographies! Got a question? No problem! Just click here to ask us about All of the Women of the Bible: 316 Concise Biographies.